Discovering the Art Bears’ Winter Songs (1978) and Henry Cow’s Western Culture (1979) was a ground zero experience for me. 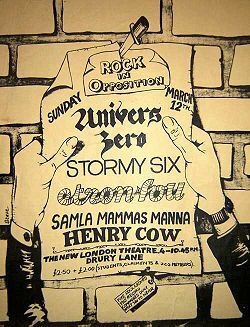 Back in the late 70s, I had on occasion come across Henry Cow in print and they always sounded interesting. They were on my list of groups to check out — if I could ever find one of their records. I had never even seen one before. I had also heard of the Art Bears. They were an offshoot of Henry Cow and one of their albums received a 5 star review in Downbeat magazine. They were also on my list of groups to check out — if I could ever find one of their records. I was living in Victoria, BC in the late 70s, but would occasionally take the ferry over to Vancouver for some record shopping. On my very first expedition to the legendary, but now extinct, Black Swan Records, I walked away with both the Art Bears’ Winter Songs and Henry Cow’s Western Culture. Hearing these two records was nothing short of a revelation. So dramatic was my reaction to hearing these two records that I started carting off most of my record collection to the local used record store in Victoria. At a stroke, I turned the page on a lot of the music I had been listening to. The Art Bears and Henry Cow killed my record collection! 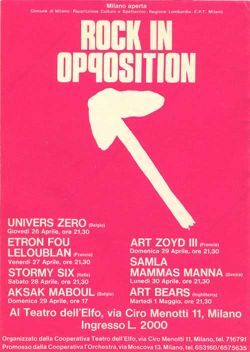 Shortly after buying the albums, I learned of their involvement in Rock in Opposition, a collective instigated by Henry Cow and which also included bands Samlas Mammas Manna from Sweden, Univers Zero from Belgium, Etron Fou Leloublan from France and Stormy Six from Italy. It was later expanded to include the Art Bears, Art Zoyd and Aksak Maboul. The Rock in Opposition groups existed outside of the recording industry and its marketing and distribution networks. (No wonder I could never find any of their records). 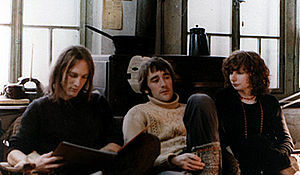 Their uncompromising approaches and refusal to fit themselves into market-friendly musical forms virtually guaranteed that the industry would not be interested in them. They therefore banded together and created their own network to help each other set up tours, release records and find new audiences. Through learning about Rock in Opposition, I developed a greater understanding of the political economy of the recording industry, and of the consequences for groups who were unable to, or chose not to, work within the parameters of the industry. Discovering the Art Bears and Henry Cow, then, led to a politicization of music for me. As a direct result, it wasn’t long before I left my job at a major record retailer just because I didn’t want to be a cog in the workings of the industry. I also shifted the bulk of my record shopping to independent record shops and labels. As well, my interest in philosophy and history developed as a result of being engaged in these social and cultural issues. This eventually led to attending college courses and going on to university. The music and working examples of these two bands, and then the other bands involved in Rock in Opposition, affected my ideas of the social world and my place in it. Life itself became different after the Art Bears & Henry Cow. When I look back and contemplate this time of my life (from a comfy armchair, espresso in hand), I sometimes think of George Bailey in It’s A Wonderful Life. Where would I be today if I never heard Winter Songs or Western Culture? Who would I be? The above is an excerpt from the forthcoming book, Music Is Rapid Transportation …from the Beatles to Xenakis, available soon from Charivari Press. The Art Bears, back in the day, (photo source unknown, sorry). You are currently browsing the archives for the Art Zoyd category.